Authorities in Laos maintain a firm grip on power and civic space through a destructive cocktail of fear and intimidation. Despite clear protections for fundamental freedoms in the constitution, space for civil society is severely restricted in Laos. Despite clear protections for fundamental freedoms in the constitution, space for civil society is severely restricted in Laos. Human Rights Defenders, particularly those working to defend communities in the face of natural resource development projects, face significant risks, including harassment, intimidation and disappearance. In December 2012, the prominent civil society activist Sombath Somphone was arrested and has not been seen since. 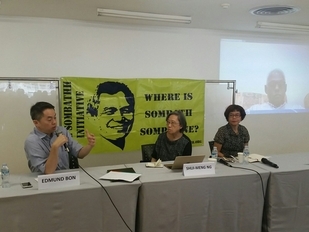 Closed circuit television footage showed that police were involved in Somphone’s disappearance, and despite a vigorous civil society campaign, authorities have failed to mount an effective investigation into his case. Rights groups report that, in total, 14 activists remain behind bars or have disappeared, some of them having been imprisoned since 1999. At least one foreign activist working on land issues has been expelled in recent years. Registration processes for civil society organisations are slow and cumbersome, with only a few applications for registration approved at the national and provincial level in 2013. Details of a new decree to control civil society even more tightly by requiring approval to receive foreign funding and limiting CSOs’ operational areas were leaked in 2014, but it has not been implemented. Freedom of international nongovernmental organisations (INGOs) in Laos was also to be further restricted under the new laws. Freedom of peaceful assembly is effectively denied by the government’s ban on participating in any organisation which engages in mass action, demonstrations or public protests that may cause social instability. Freedom of peaceful assembly is effectively denied by the government’s ban on participating in any organisation which engages in mass action, demonstrations or public protests that may cause social instability. Article 66 of the amended penal code says that anyone who even attempts to organise a protest that causes ‘damage to the society’ can be imprisoned for up to five years. Two activists who took part in a protest in 1999 were charged with treason and remain in detention almost two decades later. A planned demonstration by farmers in 2009 led to 300 arrests, and to this day security forces have failed to release or confirm the whereabouts of 9 protest ‘leaders’. Even meetings held in private can be interfered with when they deal with social issues, democracy and human rights in Laos. For example, an important regional civil society meeting in 2016 could not be held in Laos because of fears for participants’ safety. Laos view the media as the mouthpiece of the state, through which only the official position is communicated to the population. Laos view the media as the mouthpiece of the state, through which only the official position is communicated to the population. Due to the severe penalties in place for violation of this unwritten rule, self-censorship by the media is widespread. Although Laos has dozens of newspapers and television stations, the majority are owned by the state or the ruling party. Journalists follow strict content guidelines, and rarely cover sensitive topics such as the forced repatriation of Hmong refugees or the negative impacts of hydroelectric plants, land clearing and illegal logging. Faced with a blackout on independent reporting through traditional media, young people are increasingly turning to the Internet as a source of uncensored news and the number of Facebook users in Laos has soared to half a million in recent years. In response, the government passed a restrictive cybercrime law, which prohibits online criticism of the Lao government and Communist Party, and provides stiff penalties for offenders. The law was used in May 2015 when a woman posted photos of alleged police extortion on Facebook, and in June 2015 when another user was arrested for posting a document showing a local official granting a land concession to a private developer.